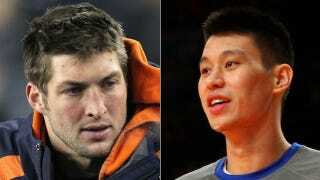 What If Tim Tebow Had A Baby With Jeremy Lin? What If Tim Tebow Had A Baby With White Michael Vick? What If Tim Tebow Had A Baby With The Panda On Yao Ming's Lap? What If Tim Tebow Had A Baby With Skip Bayless?